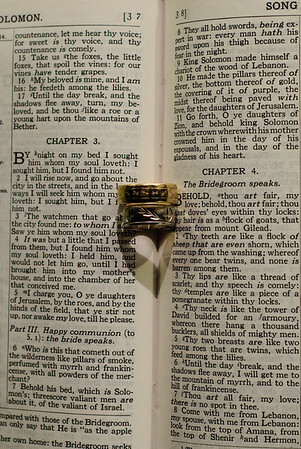 There are multiple variations how to create this image with one of the most common methods is to place a ring in middle of a Bible and shine a light into it from the side of the ring[s] out of the view of the image. My wife and I were chatting about its effect when she suggested using two rings to see how it looked. Sure enough it created a romantic look with two hearts becoming one. I used the Nikkor 50mm f/1.8 on my D200 on a tripod. Settings: f/5, ISO 800 1/5 second. If you try this, experiment with different aperture settings. As you get closer to wide open you will notice more of the text will be 'blurred out' as well as parts of the ring will go out of focus. I selected f/5 because I wanted both rings to be in focus. At f/1.8 there is very little in focus outside the focus point.